It takes two more days to find the Camino Portuguese. We run into it just north of Padron after walking a long ridge of soft mountains running parallel to the Camino. There’s a network of dirt roads through them, winding up the slopes, running along the ridge, but the Camino never sees them. From the top of the mountains, I saw the cathedral spires of Santiago rising among the rooftops of the distant city. I had to squint to see them. I didn’t know for sure they existed​ outside my imagination until I zoomed in on a photo to be sure. They are very close for three days of walking. We could have taken the bus back, hiked the Camino Portugese south from Santiago, and be at the border by now, but it felt good to float free for a few days. No arrows to follow, no signs touting pilgrim menus, no albergues to fill. We searched for water among the rocks on Mount Pindu and felt the relief that comes with the sound flowing water under rocks and the taste of that first cold gulp. 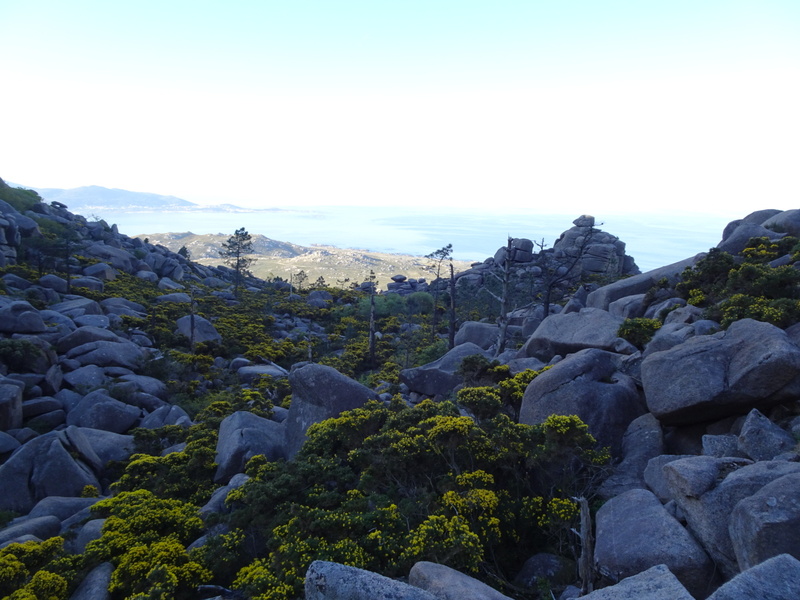 We walked through slopes of blooming yellow flowers among giant boulders, their green spikes daring any to touch them. We chased a windmill’s shadow inch by inch across a grassy hilltop as we waited for the heat of the day to pass and watched the white blades spin against the blue sky and relentless sun. We lost each other on a fork of dirt road, felt that panic that comes when you know you’ve made a mistake, felt the relief of finding each other again a kilometer away. We met a small girl in a pink dress who was standing outside her father’s grocery store. She spoke to us in Spanish and asked why we talked funny, then showed off the few English words she learned in school and told us to buy ice cream and where to find a bench to sit on in the shade. And we climbed that last ridge to stare out at the cathedral’s spires in the distance, to realize how little ground we’d saved, and to not care because it only means we have more miles ahead. Sweet!!! We (all of us hiking with you vicariously), are savoring every step and word! Today’s Zen was, “The journey of a thousand miles begins with a single step.” You’ve proved it true! What a beautiful photo! The colors are surreal. It is so like you to take a different path and find joy in it, miles having little meaning. Why DO you talk so funny?! ?